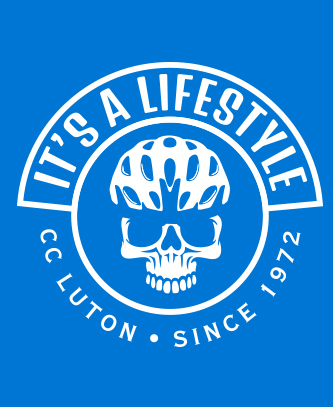 British Cycling are the governing body for mass start races in the UK, and CC Luton are affiliated to their Central Division (covering North London and South Midlands area). You can ride entry-level races with a British Cycling Bronze membership (the club has a limited number to give away free), although other events will require a Silver membership and Racing Licence (about £60). The club is also affiliated to the Milton Keynes Cycling Association and the Eastern Road Race League giving reduced entry fees or preferential entry to some of the association races. For the over 40’s there are also age-handicapped races run by the League of Veteran Racing Cyclists which are generally cheaper to enter with a cheaper licence fee. Entry to many off-road events is less strictly regulated than for road races. Some events operated under British Cycling guidelines still require you to have a full racing licence. We currently have four riders in the club who race the Cross Country National Points Series or enduro (long-distance) events. No gears, no brakes – just pure fun! Track racing uses specialist bikes with a single fixed gear (no freewheel) and no brakes (you slow down by pushing back on the pedals). The outdoor velodrome at Gosling Sports Stadium Welwyn is about a 30 minute drive from Luton and is a great place to try out bunch racing for the novice rider (track bikes can be hired at the stadium). There is a Track League held at Welwyn on Friday evenings through the Summer as well as training sessions on Monday evenings. National level races are held throughout the year at the indoor velodromes at Manchester and Newport. A full Bristish Cycling racing licence is usually required for track events. The club is affiliated to Cycling Time Trials, the governing body for UK time trial racing. This allows members to ride any open time trial event (there is no separate licence required). For the uninitiated, time trials are races against the clock over a set distance with riders starting individually at 1 minute intervals. The rider who covers the course in the shortest time wins. Usually held in the Winter months only, cyclo-cross races are traditionally ridden with lightweight off-road racing bikes (although you can use a standard mountain bike). Courses are usually less technically demanding than mountain bike events, with the competitors often required to dismount and run with their bikes over obstacles. A British Cycling racing licence may be required for some events. A rapidly growing area in the UK at present, cyclosportifs are less competitive than road races but you are still given a finishing time and position. The real challenge though is simply to complete the course, with many events being 100+ miles with upto 5,000 metres of climbing in the really hard rides. There is no requirement to have a racing licence for cyclosportifs. The events on the Continent are another level altogether with some hosting fields of over 10,000 riders and taking in spectacular and lung-busting scenery in the Alps and the Dolomites. Some of the events our riders have participated in include the Etape du Tour (a single stage of the Tour de France open for amateurs to ride), Gran Fondo Campagnolo, the cyclotourist Tour of Flandersand many others. Audaxes take their name from the French for an “audacious” achievement because of the distance covered. Entry level events are between 100 and 200km, before stepping up to 300, 400 and even 600km. The pinnacle of achievement for any audaxer is the Paris-Brest-Paris. Held every four years, riders have to complete a course unaided (other than food provided at rest stops) from Paris to Brest and back (1200km or 750 miles) within 90 hours. The difference between audax and cyclosportif events is that in audaxes, there is no winner or time recorded for each rider, simply you must complete the course (normally navigating yourself with a route instruction sheet) within set time limits. It could be said that in cyclosportifs, riders pretend they are racing, while in audax, they pretend they are not! Audax UK is the governing body for the UK events – no licence or club membership is required to ride. Surely one of the best ways to really get to see a country, cycle touring offers unlimited opportunities to experience something new every day. Some of our riders recently completed a Lands End – John O’Groats tour in 11 days, raising nearly £1,000 for a local charity in the process of having a great holiday!